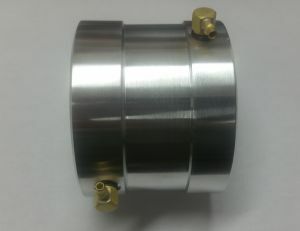 Water Jacket for the Neu 2215 Motor. This is for the 2215 with a smooth can. This will not work on Neu motors that have cooling fins. This Water Cooling Jacket has been designed for maximum heat reduction. At 2.3" long, the jacket is long enough to cool the entire length of the motor windings. Yet weighs less than 7 ounces. We picked high quality aluminum for the jacket to further help with the cooling, as the aluminum acts as a added heat sink. Than we added brass water fittings. Installation is a snap! Simply apply some lite oil to the orings and slide the center section over the Neu 2215 motor. Approx. 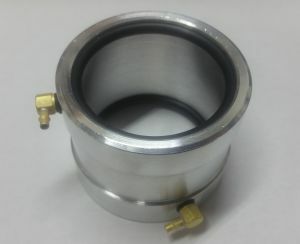 2.3" x 3.00" outside diameter.